Engaging with nature has a well-known positive effect on low mood and anxiety. Extensive evidence from Minds' national EcoMind project has shown that being outdoors in a green environment is strongly associated with improvements in well-being.1 Engagement with nature is a fundamental aspect of COATS combined with the uplifting effect of physical activity and creativity. Be more active - part of the group activity will involve walking in the green space to collect materials for art making. Take Notice of the World - By engaging the participants in a direct, positive relationship with nature it is hoped that this will engender a reciprocal desire to care for London’s green spaces. Keep learning - the group supports each other to grow. Give to others - part of the group activity will be to share work and reflections with each other. 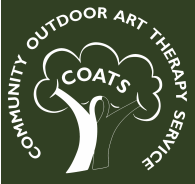 The Outdoor Art Therapists provides a safe, non-judgemental natural environment for you to engage with the art materials. The materials you will be using will either be natural or those that compliment natural art making. You do not have to be ‘good at art’ to engage with outdoor therapeutic group art. However, in order for you to get the most out of your sessions, a willingness to engage with nature and the art materials is important. What happens within the COATS Groups? Check-in to see how you are feeling at the start of the group. You will be invited to use natural materials to do this. Mindfulness exercise to ground you in the natural environment, aiding self-awareness and decreasing anxiety. Facilitated walk through parkland to collect natural materials for art making: encouraging physical exercise, social engagement and interaction with nature. Individual art making with natural materials back at the garden or in the Studio. Facilitators will also engage with participants one-to-one in this section. Group reflection on art making and sharing of any emotional issues that arose. 2) DH (2011) 2011/12 working age adult and older age adult National Survey of Investment in Mental Health Services. London: Department of Mental Health. 4) Beaumont, J and Lofts, H; 2013, Measuring National Well-being - Health, 2013. London: Office of National Statistics.